Struggling with cold blinds and multiple marks? This collection of 10 articles will help you during this critical period.The Swim-by Tune-up and early water channel Blinds and Cheating singles are described. The big step to cold blinds and multiple marks is covered in several articles. This is a must have collection for Transition level trainers. The Transition level teaches the dog about multiple marks (triples), retired guns, cold blinds and diversions. This article will get you started on a good footing. This is an extremely valuable drill when done correctly. It is done right after Swim-By (the Last step in Basics). It will greatly help your dog to understand cheating singles and seeking water. One of our very best exercises ever! Many trainers struggle the most with Transition level work and progress slows to a crawl. Instead it should be the most exciting and level as dogs learn new things every day! Here are the five of the most common troubles and tips to address them. When dogs loose confidence and get from confusing training they often gawk around and avoid looking out at destination or memory marks. this article explores this problem with analysis and solutions. Transition level-Make or break Time! Even with good Basics, the Transition level is a critical stage. Dogs are now moving into large-scale field situations, new experiences, new challenges. It is an important time that requires careful building and attention to ABC (Attiude, Balance and Control). Learn more here. Another article discussing the tricky Transition time when many dogs struggle with cold blinds, diversions and more difficult triples or even quads. A careful approach can avoid many issues. This article includes my 3 X 3 method of teaching Cold blinds to transition dogs. 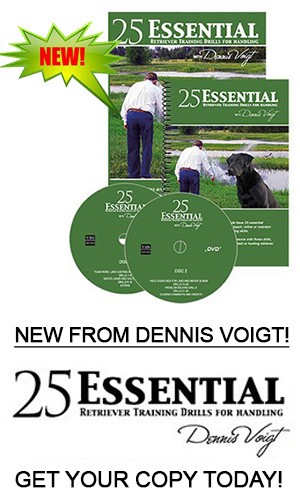 That Method is discussed detail in my 25 Essential Drills DVD. This article describe it many years before i labelled it 3 X 3! It has worked for many dogs. This article reviews the Transition steps as well as provides tested and proven advise to avoid problems or address them when they occur. Currently we have a website launch sale and discounts available. If you have never seen an issue of Retrievers ONLINE, you can view a complete issue here. Our mission is to provide the best possible information for the training, handling, judging and health of working retrievers. 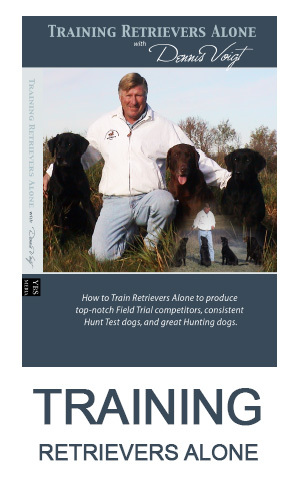 Our goal is to help you make your retrievers be "the best they can be" and you be "the best trainer and handler you can be!"